An offer: interested in to take over Mobile audio wiki project? The MobilED – mobile audio wiki – project was a research project we started in 2006. The most active years were 2006-2007, when we build a working prototype and conducted testing in two schools in South Africa. 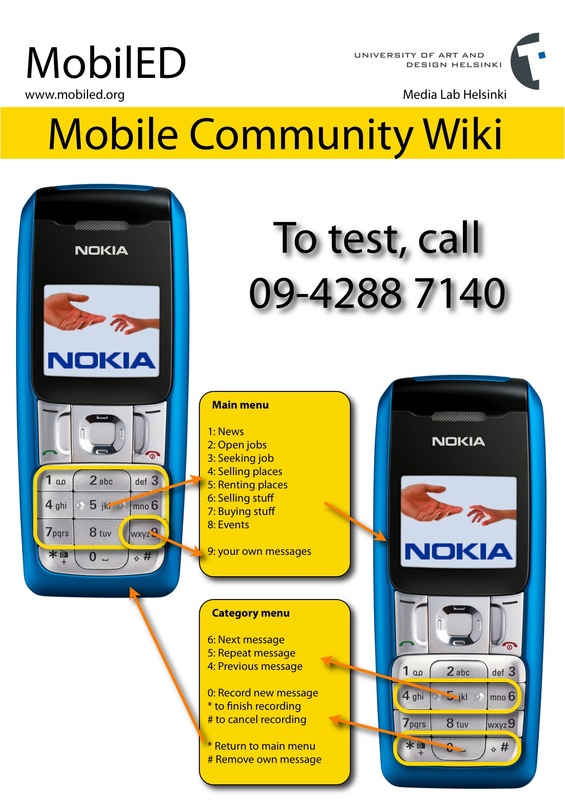 Still in 2008 we did some more testing of the service in Finland with the idea of mobile Craig’s list – local community wiki with news and classifieds. The original idea of the MobilED was to bring Wikipedia to so called “entry level” mobile phones, mainly used in the Global South. In practice the entry level mobile phones are those with voice (calling) and text message. With the MobilED prototype we demonstrated that this is possible. The content from the Wikipedia can be searched with text message and the output can be 160 characters text message sent back and/or automated call back with text to voice reading of the content. This works with the MobilED prototype. In schools we made an experiment where pupils were not only using the Wikipedia content, but also did their own school projects in audio format to the server. From there their peers, friends and parents could listen the podcasts with their entry level mobile phones. The testing was not really successful, because the servers crashed and caused a lot of trouble for the users. My conclusion on this was that at this point the system was too complicate to be used for this in schools. The experiment was, however, useful because it opened us to consider the MobliED from a new perspective. This led us to experiment, in addition to the Wikipedia to mobile phones and school project, an idea of community managed audio information system. With the service people could maintain their own audio wiki news / media service with local news, classified etc. We made a prototype for this purpose, too. It worked but was never took for further development and dissemination. In the research group we are now working with totally new challenges, such as services for smart phones/laptops and interactive white boards in classrooms. As you might have seen, MobilED project and the blog have not been very active in a couple of years. Because I think that many things we did in the research project are valuable, I would love to see someone taking over the project and continuing the work. Finalize the mobile audio Wikipedia configuration and start to negotiate with the operators / governments to provide this for free in the Global South. Finalize the mobile audio community news/media service and start to offer it in the Global South. I am not a right person to do business / sustainability plan. This you must think and design yourself. I may, however, give my comments on it – if you wish. I am not interested in to start another “research” project, so do not propose to apply new grants for this. What I would like to see is a business or non-governmental organization taking the product to “the market”. We also have the domain: mobiled.org. The Wikimania 2009 is, again, an amazing gathering of Wikipedians and Wikimedians: editors, activists, researchers. I am presenting MobilED with the title “Audio Wiki for Mobile Communities: Information Systems for the Rest of Us”. My angle is to focus on how the audio wiki could be used to build up services providing “… classifieds and forums for jobs, housing, for sale, personals, services, local community, and events.” (thank you Craigslist). When Mobile audio wikis will take off? We were happy to found out that we are no more alone with the mobile audio wiki idea. We already knew that some people in IBM Indian Research Laboratory are developing several audio-based information systems relying on speech technologies and have also thought to integrate text messaging (SMS) in them. However, as far as we know, they are not thinking the “wiki”-way. 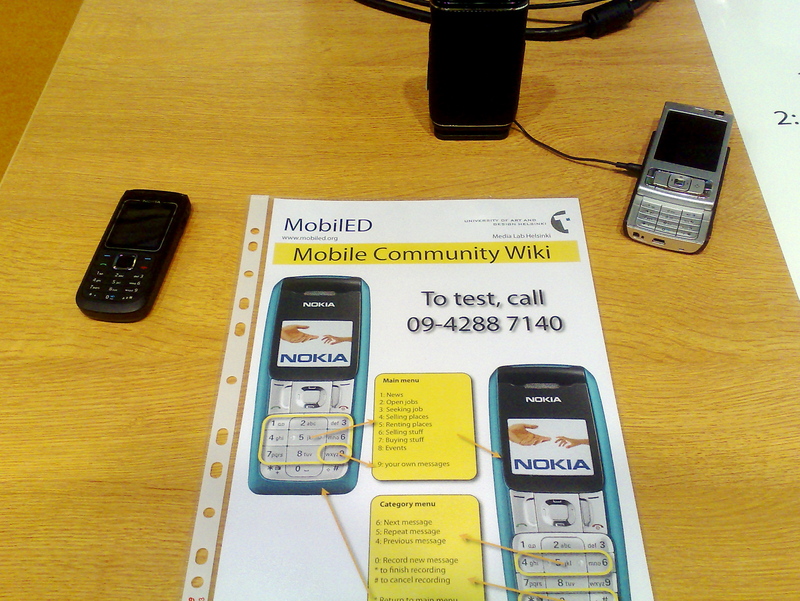 Now we found out (thank you Andrea for the link) that some people in the Nokia Research Center have also been working on mobile audio wiki idea for some time. They call the prototype Mosoko. I think it is great to see that the idea we presented in early 2006 is taking off in many places same time. This is definitely a proof of the idea. Now we just wait that someone will catch the ball and make it real. It’s about the time to have WELL, Wikipedia and Craigslist for the rest of us. And they will be mobile. Making ourselves comfortable in old harbor halls. 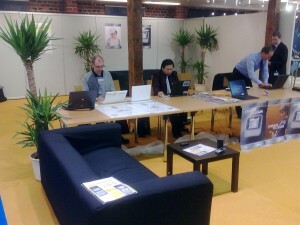 So we have been presenting MobilED Community Wiki at Grasping The Future 08 – conference in Helsinki for two days. The reception has been surprisingly positive and interested, as both the Community Wiki and Audio Encyclopaedia -applications are primarily designed for cultures with stronger oral tradition and less internet than our Finnish culture. We are sharing a stand with two more projects supported by Nokia: Mobiledu from China (with 3 000 000 users!) and Sanako’s Choose to Learn -initiative. We have met some very interesting people with exciting proposals for possible uses of MobilED platform and we will get into contact with them after the conference. Have you heard of Craig’s list? It’s pretty popular. Why? It’s a service with information that everyone needs once in a while. It’s local classifieds and forums, which are community moderated and free. 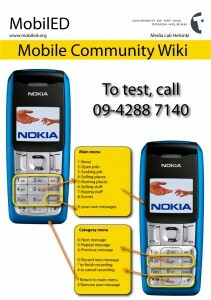 The MobilED Community Wiki brings the same services to mobile users. No need for Internet access or smart phones – MobilED works on any phone in the world. This is important for everybody – especially for people with strong oral tradition and limited Internet access. We have a new prototype setup of the MobilED server to test and demonstrate what one can do with it. You may call the number: +358-9-4288 7140 to try it out. You may also check out the Wiki view, meant for editing and moderating the content. Edit: the phone number mentioned is no longer available, as the pilot has ended. This week we have been setting up a new MobilED server that works as a platform for local news and classifieds. The basic idea is still the same – MobilED is an audio wiki, you may reach with your phone – but this time it is designed for very specific purpose. The local community service works so that anyone can set up a wiki-site on which you can make a call. Then you can navigate to different sections like (1) news, (2) jobs, (3) job seekers, (4) sell place, (5) rent place, (6) sell stuff, (7) buy stuff, (8) events and (9) my messages. We are starting to test the new service internally next week. It has been quiet in the MobilED project. In the Helsinki team we have been writing an article where we conclude that probably the best area where one could use MobilED technology, and the basic interaction provided with it, could actually be rather generic community information system than a service used in formal education, such as in schools. This direction is not taking MobilED out from the “learning landscape” but it may expand the research focus. It will maybe help us to consider MobilED more as a media service – from people to people – than an “educational service”. I think MobilED could be something like a mobile community newspaper or …well… in case of digital world it would be something like craigslist but all in mobile. The service could provide local classified and forums for community news, jobs, housing, for sale, personals, services, and events. You send a text message with the word “news” to the number of your community and the service will call you back. During the call you can listen what kind of news people have dictate to the MobilED service, jump from one to another and if you wish add your own news to the server. Similar way you could send text message with the word “jobs” and get a call back with a list of open jobs in your area. As the service works with the Mediawiki platform it could be accessible also from the web, and the editorial community could maintain the service in very easy way also from the website. We hope to get the manuscript of the research paper discussing this idea ready in a few coming weeks. Please, let us know what do you think about the idea, so we can include your comments to the paper. With their global network, UNICEF may have a real impact in the field. The list of the UNIWiki projects underway and plannned, as well as the technology they are planning to use in them, is very interesting. MobilED is in there, too. The Wikimania 2007, the international Wikimedia conference is, talking place in Taipei on this weekend. Me (Teemu) and Kim from Meraka South Africa are presenting their projects, including MobilED. Many participants are presenting ideas and proposals on how to use Wikis on mobile phones and how to distribute free content in the developing world. It looks that, sometimes people forget the “wiki way”(* and are more interested in to deliver existing wiki-content to the developing world (in English or in French). I hope we will not do the same mistake in MobilED. *) Free content that is collaboratively authored.